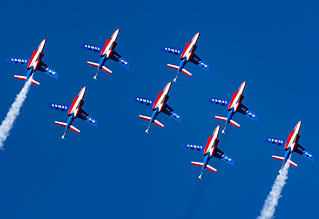 The bi-annual Belgian Air Force Days airshow rotates around a number of the airbases and this year it was the turn of the Vliegbasis Kleine-Brogel to host the event. Previously hosted here in 2014, many had fond memories of a well-run event with a strong static and excellent flying displays, particular highlights being the abundant use of flares and the intense tactical attack sequence. The show was not without its faults but maintained the reputation of Kleine-Brogel for organising and hosting popular events. Expectations were therefore high that the 2018 event would once again be a classic. 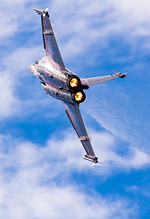 Making the journey across the Channel for UK Airshow Review, Andy Evans attended all three days of the event. Photography by the author and Gordon Duncan. Centred on the theme of "Ready for the Future" the Belgian Air Force were keen to show off what equipment they had ordered, or could possibly be ordering, in order to maintain its relevance within Europe and the wider NATO alliance. The show was strongly supported by the industry who provided equipment that has been ordered or that might be in the future. With the first Belgian examples on the production line, Airbus provided an A400M for static display, still adorning its garish RAF100 logo from flying display duty at RAF Fairford a few months before. 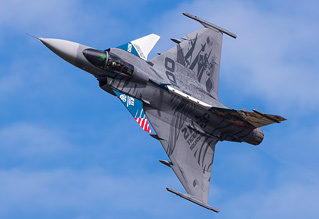 However, the highlight of this key theme was the attendance of all three contenders to replace the venerable F-16 as their primary combat aircraft: the Dassault Rafale, Eurofighter Typhoon and the Lockheed Martin F-35A. 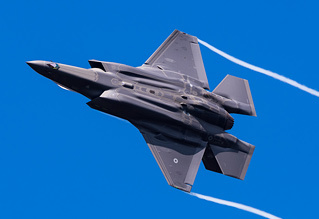 The F-35's attendance also represented a triple debut for the type, namely the first landing of an F-35 in Belgium, the airshow debut of an Italian Air Force F-35A, and the airshow debut of an Italian assembled F-35, this being of particular significance should Belgium order the aircraft as the likely assembly location would be Italy. It also made a pleasant change to see an F-35 on display at an airshow not surrounded by fencing and armed guards, the aircraft being placed in the static line-up along with the rest of the participants. Joining these aircraft on the ground was an entire circus of representatives and sales people from their respective manufacturers trying to woo the assembled officials. 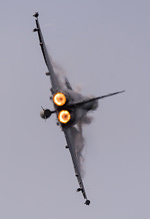 This included BAE Systems also provided their Tempest mock-up in support of the Eurofighter contingent, offering a potential partnership in the development of this 6th generation fighter should the Typhoon be chosen. Held over the course of three days, the airshow is effectively split into two parts, a 'spotters day' on the Friday aimed at the enthusiast and, a two-day airshow held over the weekend. Whilst occurring under the same banner, the two events should be viewed separately as to what was on offer and how successful they were. Firstly, when enthusiasts think of spotters days, they think of an event that has been tailor made to their requirements, allowing for photographic opportunities of all aircraft present from a myriad of different angles at relatively close distances in a setting that they normally don't get access to. It was perhaps therefore unfair of the Belgian Air Force to call this event a 'spotters day', a fairer description would have been an 'arrivals day'. Whilst there were organisational difficulties, including some being given car passes for car parks that were only open at the weekend, the event did not offer the opportunities expected by many. The majority of the aircraft arriving for static display exiting the runway at the half-way point which resulted in the assembled crowd at the end of the runway - including the dedicated disabled enclosure - never having an opportunity to photograph them. The same could also be said for arriving display assets who either turned off short or taxied directly into the HAS complex depriving the enthusiast of the opportunities they had travelled so far to experience. This type of movement is to be expected when an airfield is busy, however, for much of the day, the airspace and airfield were empty of all other movements. Of course, not all aircraft followed this pattern and those that did play to the crowd were welcome, including the Ukrainian Su-27 duo who made a stunning low arrival with their support Il-76 and taxied the length of the taxiway on arrival, much to everyone's delight. 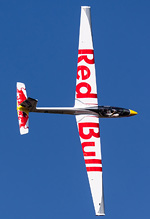 Kleine-Brogel is well known for putting on excellent spotters days, however, this Friday event fell well short of the mark. Turning our attention to the main event, this two-day airshow followed a similar format to other shows this base has played host to in the past. Utilising the parallel runway/taxiway airshows at Kleine-Brogel present, to the British military airshow goer, an unusual layout where the static aircraft are displayed in front of the crowd line with the active runway behind them. This layout does afford the advantage that the visitor doesn't need to miss any of the flying display to walk the static display whilst also keeping display aircraft within photographic reach. The layout however does limit the angles available on the static and has the unfortunate effect that people who have set up position for the day find their equipment constantly being trampled on, their personal space being invaded and - in some instances - being pushed out the way by people wanting to photograph the static. Whilst down on numbers from previous years, the static display was varied and full of international participants including some rotary gems. Making rare appearances at an airshow were an Austrian Alouette III plus Portuguese and Danish EH101 Merlins. The latter were also joined by a Royal Navy example - parked together these gave a rare visual comparison of the varying colour schemes used. Joining them on display was an NH-90 Caiman and Tigre attack helicopter of the French Army - types that we cannot recall seeing at a UK airshow. The Royal Navy Merlin was not the only British participant: the show enjoyed an unusually strong British contingent in the static with the inclusion of an RAF Typhoon (parked with the F-35 and Rafale to complete the fighter competition contenders) and a pair of Hawk T2s from RAF Valley. On paper, the flying appeared to be as varied as the static display with many of the fast jet displays in Europe participating, including the RAF Typhoon. Unfortunately, on the Saturday, the scheduling of the acts meant that the impact of this strong lineup was lost thanks to the large gaps between fast jet displays with "filler" acts. It was pleasing to witness that on the Sunday - the day with the better weather - the flying display had a better flow that was more suited to the event. The flying display also contained a number of final appearances. Appearing for the last time at an airshow before retirement, the Belgian Air Force Sea King performed alongside its replacement, the NH90, on both days providing SAR demonstrations. 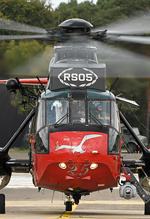 When not in the air, and still resplendent in the special scheme it has carried for a number of years, RS-05 took pride of place in the static display, positioned so as to be visible to all as they entered the showground. Also making his final ever public display was Colonel Oleksandr Oksanchenko of the Ukrainian Air Force in his Su-27. Col. Oksanchenko has acted as display pilot for many years and will be retiring in a few months' time. It was therefore only fitting that his Su-27 was the star of the show, and that his final display was recognised by the base with a water salute upon landing on the Sunday. What was surprising to many was the complete lack of flare use by any display throughout the airshow, a point that was a source of some dismay and anger thanks to Kleine-Brogel's reputation for being a flare-heavy display venue. There were many rumoured reasons for this among the gathered enthusiasts, including regulation changes, however the real reason for the lack of flares was the weather. Thanks to the wind speed and direction over the weekend, there was a high likelihood of debris falling on the runway, representing a FOD risk. The decision not to incorporate flares in the flying display was therefore rightly taken for safety reasons. 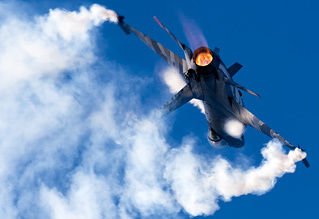 The engagement of the 72,000 weekend visitors was a key show objective and therefore it was hardly surprising that the home team would take centre stage with strong performances from the A109 display team, and the F-16 'Dark Falcon' flown by Vador; the latter also performing a pairs routine with a Spitfire each day. Joining these regular display items was the based 31 Squadron who performed as a four-ship F-16 display team called the Thunder Tigers - the display wasn't of the same standard of say, Couteau Delta, but it was spirited and gave a good idea of F-16 tactical manoeuvres. Speaking of tactical manoeuvres, previous events at Kleine-Brogel have included a popular staged tactical scenario involving multiple assets and significant numbers of troops. This, perhaps, is the greatest engagement tool at the disposal of the organisers. It is therefore baffling as to why no tactical demonstration was scheduled for the 2018 event, and it was a noticeable omission from what was otherwise a successful event. 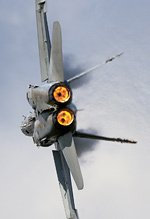 Hopefully this popular feature will return to the Belgian Air Force days in the future. Continuing with the engagement theme, in an effort to connect with young female visitors, the organisers employed ex-RCAF Snowbird Major Indira 'Bubbles' Thakorie to join the commentary team. Not only were her tones and comments mildly irritating but, as she repeatedly admitted, she had no interest in or possessed any aviation knowledge, two things that are basic requirements for an airshow commentator. Surely the engagement would have been more effective with a more knowledgeable female commentator? In all, the Belgian Air Force Days 2018 was a successful event, blessed for the most part with good weather and international participation that any military airshow would be proud of. Yes, the show won't go down in history as a classic Kleine-Brogel but that doesn't mean it wasn't a good event. There were also improvements to the showground over 2014, including more food and toilet areas. Whilst visitors have to pay to use the essential toilets, a big improvement was made over 2014 - the ability to wash your hands! When a good service is provided, you then don't mind having to pay. When writing the 2014 review, I commented that the view of someone who attended three days rather than one would probably be different. This year proved this point. Attending all three days has given me a positive perspective that the show was a success. However if I had only attended the Friday or the Saturday, I'm not so sure my view would have been the same. 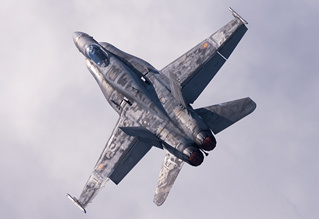 At the time of writing, we understand that there are no future Belgian Air Force Days planned until 2021 when it may be hosted by Vliegbasis Koksijde to mark its closure. However, this is yet to be confirmed.